Taste test: Not bad. Very subtle flavor  not very sour creamy or oniony, but quite acceptable. Smell test: Potatoey, kind of salty. 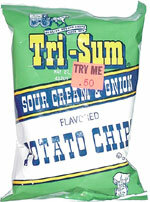 This snack was discovered by Keith at Cardullo's Gourmet Shoppe, Harvard Square, Cambridge, Massachusetts.